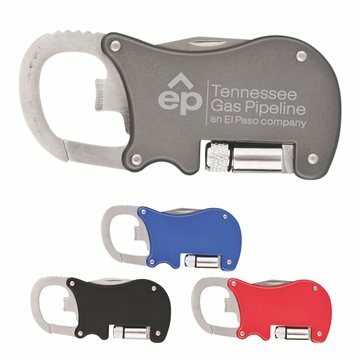 Built-in bottle opener and carabiner. Pull-out pocket knife and LED flashlight. It looks great, but we shall see. these were beautiful! Our logo was too large to fit within the dimensions, your artist did an amaxing job altering our loggo to fit the print area, we love the outcome. Convenient , affordable, customizable and user friendly! What more can you ask for? Graet Material!